OK - if you are like me, you will look at the ingredients and instructions for this receipe and say to yourself "Jeez people, what is the big deal?" Well- don't do it. 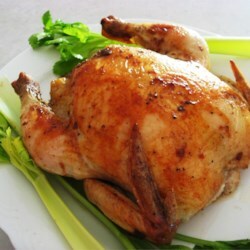 I chose this receipe simply because I had a whole chicken, not a lot of time, and needed to cook it. I have NO idea why the combination of these ingredients or this cooking method (I followed it EXACTLY as written, but used real butter) yields such a wonderfully TASTY bird...but it does! If you don't try this, you're missing out. If you do try this, I venture to say that, you will be very pleasantly surprised!